For better or worse, this is damn near perfect Sunday evening television. The mixture of romance, drama (or maybe melodrama), mystery, comedy and action all dressed up in beautiful period finery is just what you need for a bit of escapism as you try to forget about the looming Monday morning. Downton Abbey’s success in this very specific category is one of the things that made it one of my top shows of last year, and as it stands at the moment, it’s looking likely to put in a second appearance. One of the tricks Downton used very successfully was jumping several months at a time between episodes meaning that just 8 episodes cover the whole of the war and the immediate fallout of it. The overarching “death and destruction” of the war did get rather depressing at times (obviously). Matthew got the brunt of it with his endless to-ing and fro-ing to the front and everyone worrying about him until he eventually returned injured for yet another contrived set of plot devices. He wasn’t the only one suffering from… well I hesitate to say ridiculous, but some of the storylines weren’t far off. The particular ‘standout’ being the possible return of a missing heir, thought dead on the Titanic, now back with questionable motive and a ‘convenient’ set of disfiguring burns. That really did get a little silly to be honest. or anything. Other stories ended up a little over done and tiresome in turn – the development of Saint Sybil, smitten William and uninterested Daisy, and don’t get me started on bloody Jane the housemaid. On the plus side however they made O’Brien a bit more interesting this year turning her from a weirdly cheesy villain into someone who is capable for caring for people and with some sort of morals. It’s a shame they couldn’t give the same treatment to Thomas who was still a loathsome little toad. 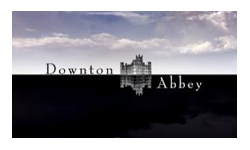 Frustratingly when it comes to writing a review of Downton Abbey it ends up sounding quite negative. But despite, or maybe even because of the daft plots, rather chewy dialogue and occasionally frustrating characters I really do love it. It’s one of those shows that you just have to settle in with and wrap yourself up; it’s cozy and relaxing. The only thing that I would change would be to make the season a bit longer and put it on a little bit later in the year just so that you could properly snuggle in with it with a roaring fire.